Making Progress in This Downsizing Stage! Good heavens, it seems like the term “downsizing” has been a part of our lives for nearly 10 years. That’s because it HAS been. It was in 2008 that we decided to embrace a big transition from a large two-story suburban home in Illinois with four-bedrooms, 2 ½ baths, a full basement, a two-car garage with attic, and a garden shed in the backyard. We moved to Colorado in 2010. Our household has been moved SIX times after having been in our former house for 19 years! It’s been pretty crazy. If you want to read more, go to our 12mph.com posts from August 2010. 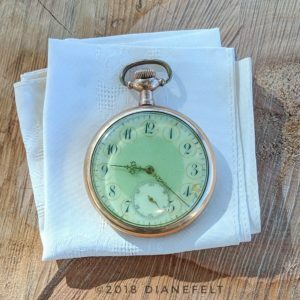 I have been reading blog posts by people who are “full-timing” in their RVs. Some are retirees who have downsized for the first time from homes filled with belongings. Other folks are millenials, working while “full-timing” and have little accumulation of belongings before hitting the road. Two points of relief that Steve and I share: #1 it’s good that we did so much downsizing back in Illinois; and, #2 by the time we’re “full-timing” later this year, we will have minimal to handle when we settle again down the road. We live in a rental home in Denver that is about 900 square feet. It’s a one-level, no basement, no garage, and no attic. It does have a nice storage shed in the backyard. The second bedroom of the house is what we’ve coined “The Archive Room”. Other than a closet for my clothes, the rest of the room holds the family archives that I inherited from my parents and grandparents plus from Steve, me, and our children. 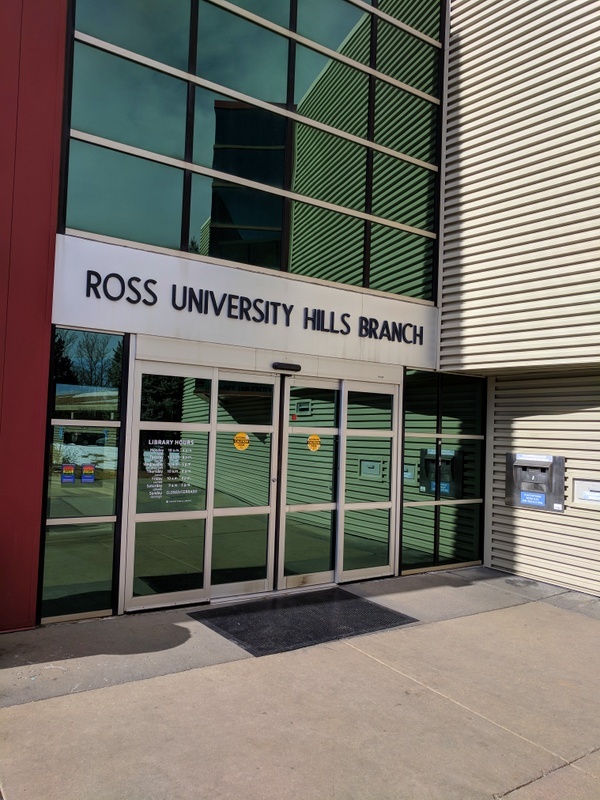 The archives have books, photos, slides, scrapbooks, genealogy files, quilts, afghans, blankets, dolls, artwork, china, cookbooks, tools, slide projector, musical instrument and music, old letters and cards, documents, and antique/vintage clothing. 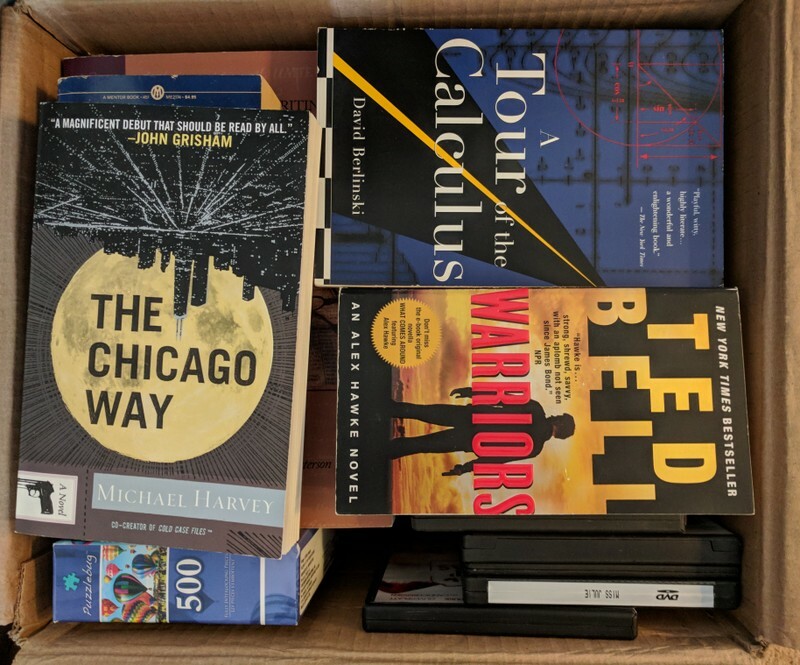 Last summer, knowing that we were shifting gears in 2018, I worked feverishly to identify items for a yard sale, price them, and then have a one-day sale. The hours of pricing and sitting in the heat on sale day was frustrating. In the end, we had a lackluster sale. Everything that was left, we immediately loaded into the car and took a trip to Goodwill. The rule of the day: what wasn’t sold, could not come back into the house, but had to go for donation. Suffering from the 90+ degree heat and late afternoon finish, we didn’t research for the best place to donate. In hindsight, we should have taken items to ARC with its wonderful mission. The one very positive aspect of last summer’s yard sale was that a latecomer to the sale was introduced to the 100-year old piano (formerly my Grandma Geneva’s) that was FREE for the moving. It was heart-warming to find this lovely grandmother named Marilee in the neighborhood to take my piano. We were pleased knowing that her grand-daughters would enjoy it. Steve and I just had to be realistic. Each move has been hard on this treasure plus expensive to move and/or store. In late October, a number of items went with me to Iowa to be sold as part of a fundraiser for a medical benefit. It was a wonderful way to help a cause and see some special belongings find a new home. 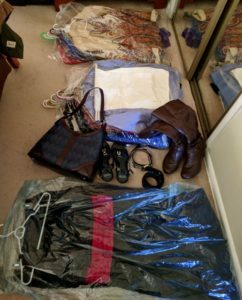 Before taking a December trip to visit family in Santa Fe, New Mexico, Steve and I went through our coat closet. 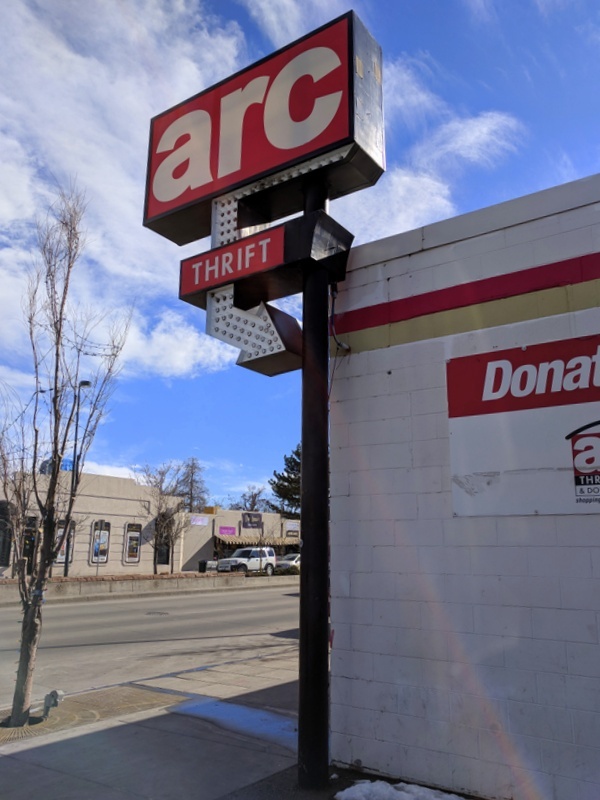 We had an opportunity to donate coats, jackets, and gloves to youth in Santa Fe. The donations were timely as temperatures were frigid and youth needed staying warm. Youth Shelters & Family Services of Santa Fe is a Santa Fe-based non-profit organization dedicated to helping at-risk and homeless youth in the region find a way home and a path to a productive, happy life. Earlier this month, we sorted through our Christmas decorations as we took them down to pack away. I took photos of items we no longer wanted and shared them with our children. They let me know if they wanted something. We filled a tub for donation. I have sorted through my clothes: socks, shoes, purses, sweaters, slacks, dresses/skirts, jackets, tops, shorts, and jeans. From that gleaning, I contacted the Act II Consignment Shop in Littleton, where I’ve purchased numerous items of clothing the past five years. Of the 36 items that I took for preview, they took 20 items that are now on consignment. For the time spent driving to and fro, plus the 40% that I will receive (they are also having a 25% off sale, so it cuts into profit), I’m not going to realize as much as I hoped. I don’t plan to consign again, unless it is furniture or high-end antiques. 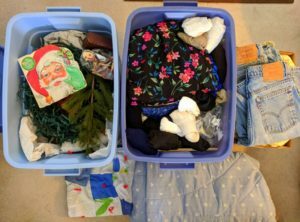 Today, I took the remaining clothes, Christmas décor, and some bedding to ARC in Denver. ARC is a tax-exempt, non-profit organization dedicated to creating and funding programs that serve those individuals living with intellectual/development disabilities, with complex and evolving needs. Last week I did a round-up of my “Joy Gang”. I’m a former preschool teacher. Between my children and me, we collected some cute puppets and stuffed animals over the years. 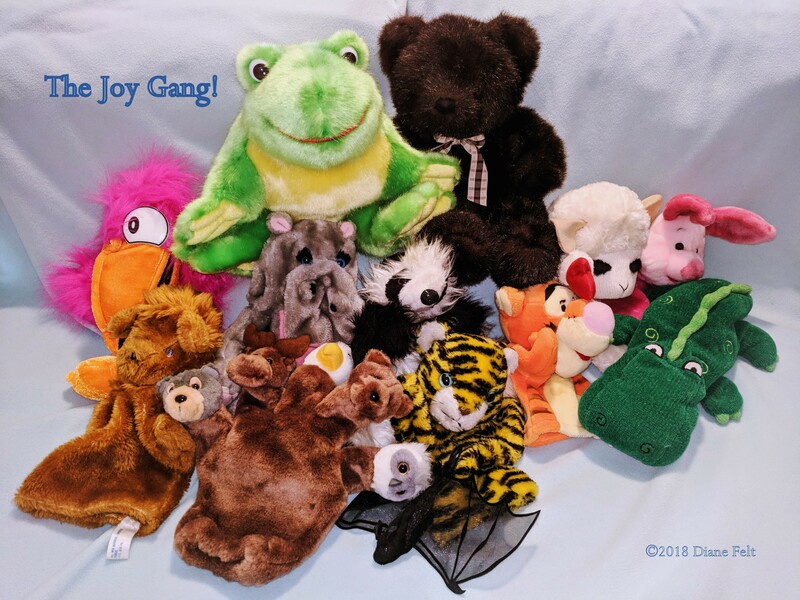 I coined them the “Joy Gang” because they brought joy to my preschool students when I used the puppets and stuffed animals to help tell stories or reinforce themes. I researched what organization in Denver may take gently used puppets and stuffed animals. Not too many as it turns out. Near our neighborhood though, I found a perfect place. 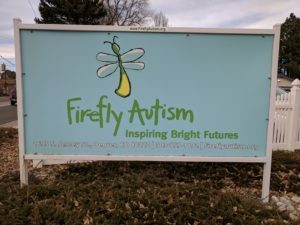 Firefly Autism is a non-profit and Colorado’s premiere autism therapy and behavioral support program. Featuring Applied Behavior Analysis techniques, in the classroom, and in the home. I explained that the puppets and animals were gently used and have been packed away for nine years. They were pleased to take them. These cute classroom aids will either remain in-house for classes or be used for their home-based program. My heart was full knowing they’d bring love and joy to more children. Steve and I have gone through some of our books. Books have been a staple in our lives and in the lives of our parents and children. In fact, we visit our Ross-University Hills neighborhood branch of the Denver Public Library at least twice a week. 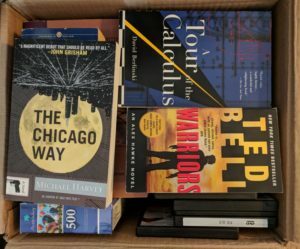 They accept one box of donations per week, so today they received a box filled with books and a handful of DVD movies. Denver Public Library connects people with information, ideas, and experiences to provide enjoyment, enrich lives, and strengthen our community. For tax deduction purposes, take photos of donations and create a spreadsheet. (Although, we do not itemize these days, we used this method in 2009 for our major downsize. It was a huge help when completing the tax forms). If you are going to “miss” the item, take a photo to look at later. Sometimes I return to photos just for the fun of it. It’s a good reminder for what “stuff” I do not miss from our big house! Take a photo inventory. If you don’t have time to spare, then later look at the photos to create an “Inventory” list. This is helpful for insurance purposes. Create a numbering system for boxes or tubs. We had something like 200 boxes or tubs in the first move in 2009. It REALLY helped knowing what items were in each of the boxes/tubs! Your time is precious. I’m realizing now that the time I invested into the yard sale last year and into taking items to consignment recently, could be better used elsewhere. Selling items from my household may bring in a few hundred dollars (not thousands for sure), but that doesn’t necessarily help if I/we invest many hours to realize that amount. We’re keeping our sights on a 10-feet by 10-feet storage unit, a travel trailer, and pick-up truck. Stay tuned as to our progress! Several people have inquired as to how we have determined a timeline that will launch us into a full-time mobile lifestyle a.k.a. living on the road in a travel trailer. First of all, our timeline isn’t cut in stone. What has been beneficial was the advice of my friend, Judy, to join several Facebook groups related to “full-timing.” Soon after my call with her in early October 2017, I joined these groups. 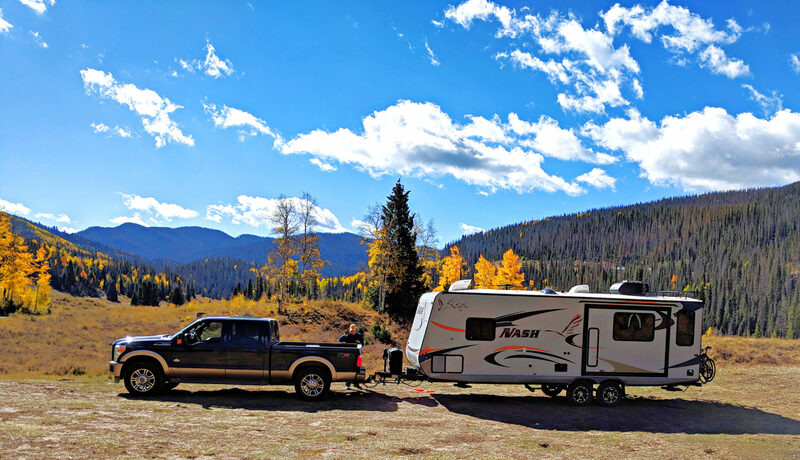 Three such groups include Frugal Full-Time RVers, How to RV for Newbies, RV Tips and Helpful Hints. As we read the various posts and comments in those groups, we have been taking notes and keeping them in a separate Google document in categories. It helps to foresee some potential concerns as full-timers. The many tips that saged travelers are sharing will hopefully serve us well. Plus, the timing in joining the groups has been perfect, providing us with roughly a year of tips and notes, if we launch in October or November of this year! During most weeks since October of last year, household items are earmarked to give to family, sell, or donate. This process also helps in recording an actual inventory for insurance purposes. I take photos. Later, I add items to a Google document inventory list. We label the boxes or tubs with numbers to track their contents. We are setting aside utensils, cookware, towels, and bedding for the trailer. The bulk of our belongings should be gleaned by June, except for some furniture, which may be a bit later. Key points to consider: when was each item last used/worn, would a photo of it suffice for memory’s sake, there is a price for storage. Once the number of household belongings have shrunk noticeably, this will give us a better idea of the unit size. Our goal as of now would be a 10’ X 10’. Climate controlled will be needed so as not to freeze or bake our belongings depending on the season. We have used two different storage facilities in the area in between prior moves. We will visit them to see what options and pricing work best. We will move belongings into the unit about one month prior to leaving. Key points to consider: price, security, access, potential water leaks, potential rodent issues. We anticipate looping back to the Metro Denver area several times a year. During those times, we will need a space to store the trailer unless we camp at one of the state parks in the area. The best option if we need to store it, is having RV storage at the same facility where our household belongings are stored. Key points to consider: security, access, possible electric hookup to keep the batteries from draining, waste water dumping station, access for filling water tank when leaving. We test drove pick-up trucks last November and December. Some factors for determining the tow vehicle: the weight range of the trailer, its tongue weight, estimated weight of contents, and desire to drive on off-the-beaten-path roads. A diesel truck with good torque power is in order. Research is on-going as we have tagged our favorite Ford 250’s and Ram 2500’s on Car Gurus based on the specifications we need. I had a phone consultation with Alec, a diesel mechanic (he maintains the corporate fleet of trucks for our son-in-law’s company), to assure that we had a good understanding of the specifications needed. (Plus, he’s a phone call away to inspect the truck once we find one). It’s fun to watch prices drop on some of these vehicles. We hope to find a truck in March or April. Key points to consider: price, bed liner, tow package, cab comfort (we’ll be spending a great deal of time there, our windshield will be our new picture window). As a child, our family had a 16′ Concord Trailer. During their retirement, my parents purchased a 32′ trailer when they were snowbirds from Iowa, enjoying warmer weather in the South. Family and friends have trailers. Thus, we have familiarity with them. As we began our research, last fall we visited two RV dealers in Metro Denver. 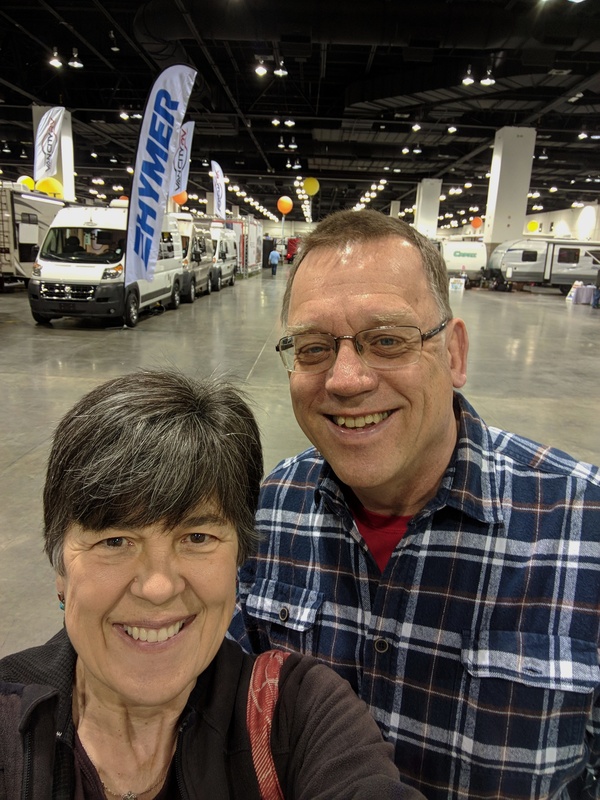 Then earlier this month (January 2018), we attended the Colorado RV Show. We know what floorplan and features we prefer in a 4-season travel trailer. Lance and Northland are the two brands that we are following. Our favorite used models are tagged to track price changes on the RVTrader website. The timing of the purchase will be based on price and location. It may mean driving to another state to purchase it. It could be as soon as June and as late as September. Key points to consider: price, separate seating area besides dinette, insulation R-factor, thermal/double-pane windows, insulated underbelly, heated tanks, higher off-road clearance. Getting our personal business affairs in order begins in April or May to give us ample time. We will keep Colorado as our domicile state. Without an apartment or a house, options for one’s address include using a family member’s address or establishing personalized mail service through a business such as a UPS store, where we can use their street address. Everything will need to be updated: drivers’ licenses, vehicle/trailer insurance, health insurance, voting cards, bank accounts, credit card, and cell phone plan. Our will and Durable Power of Attorney for Healthcare were updated in 2016-17, so they are set. Key points to consider: crossing “t’s” and dotting “i’s” to assure all is in order, mobile access to accounts, tracking renewals that need to be done in person, when to return for our physicals and dental appointments, not burdening family. We love to read books. It may be time to shift to mainly e-books. Our laptops are out-of-date, so we’ll explore options. I edit photos, so I would appreciate a good quality RGB screen. Our scanner will be left it storage and await scanning the photos that don’t get scanned this year. We will not need a printer. We will take advantage of free wi-fi when we get fuel, visit libraries, or stop at coffee shops. If we need to print something, libraries and office stores have them. We will purchase devices across time based on our budget. Key points to consider: budget, being off grid, Google voice. Later in 2018 when we see that we’re nearing 30 days from launching, we will give our one month’s notice to our landlord. We’ve already had a conversation with him, so he can anticipate our leaving. Key points to consider: avoid having to pay an additional month’s rent if we can comfortably be out sooner. Because we have experienced several big transitions and many moves during our marriage, we know how we both tick. Communication is key. Stepping away to gain perspective is healthy. While we both are good at organizing, my tendency is to get things moving now. Steve is more methodical. Thank heavens for a healthy balance, right?! Overall, our timeline is flexible and open to being tweaked along the way. Besides, we want to take joy in the journey and be mindful of the shift to a simplified lifestyle, embracing it as a gift! It has been years since we’ve been active on 12mph.com. I guess we needed to shift gears in order to revisit our blog site. We are in the process of a big transition in 2018. Steve will retire. Diane will step back from her businesses. We will downsize our household enough to fill a 10 feet by 10 feet climate-controlled storage unit. Our lifestyle will become mobile as we purchase a pick-up as a tow vehicle and a travel trailer in which to live. By later this year, we anticipate turning in the keys on the house we’ve been renting and then driving away to explore many miles together over hopefully many years. In the coming weeks or months, we will reconstruct 12mph.com. It will be fun to spruce up the theme and make it into something where we can easily post along our travels and readers can readily access it on desktop or on mobile devices. Our son, Jeremy, created 12mph.com for our 2005 summer. He coined the journey as “The Speed of Sanity.” Going 12mph on a bike does that to you. In 2005 Steve bicycled across the U.S. from Bandon, Oregon to Yorkton, Virginia. Diane flew some, but drove a good chunk that summer, even having daughter, Stephanie, joining her for some of it. We also used 12mph.com for our 2010 shift from living in Illinois, traveling in Europe that summer, and settling into life in Denver, Colorado. These blog posts can readily be accessed on this website, so feel free to peek into our past! But, “The Speed of Sanity” is also a mindset! Thus, this next chapter of life will be grounded in this theme. August 15, 2005. Steve finished his ride across the U.S. 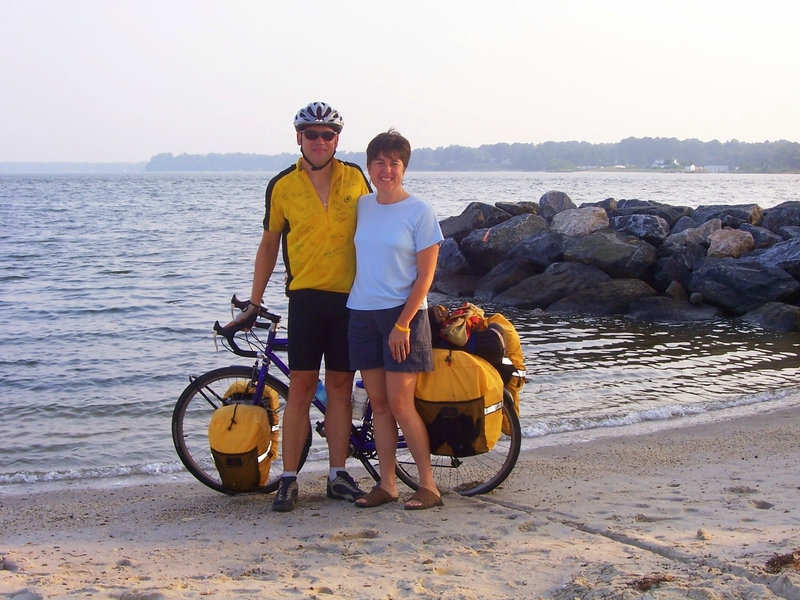 He dipped his tire in the salt waters of Chesapeake Bay in Yorktown, Virginia with Diane there to cheer him on! 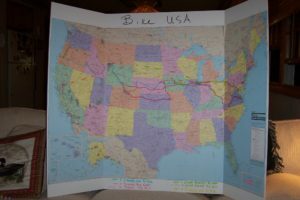 This map of the U.S. was for our 2005 summer, Steve’s blue biking route; Diane’s pink (flying and driving); and, their joint green route with a mix of biking together, flying to Oregon, and driving home from Virginia. It’s 13 years later! Steve and Diane went to the Colorado RV Show on January 5, 2018. Ready to explore travel trailer options!